This news item was posted in Technology category and has 116 Comments so far . 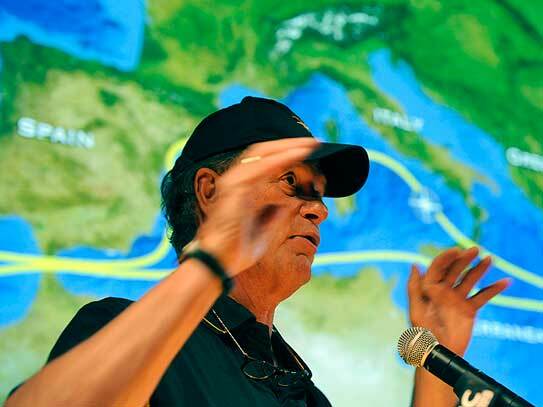 MYSTIC: Oceanographer Robert Ballard, best known for discovering the Titanic wreck, has new plans to plumb the depths of the seas. Ballard said Thursday that his latest deep-sea venture will send crews combing through the Black, Aegean and Mediterranean seas for artifacts from ship wrecks and ancient civilizations. His research vessel, the E/V Nautilus, set out from a port in Turkey last week on a four-month mission that will use four remote-operated vehicles and sonar technology to explore lost cities, as well as hydrothermal vents and undersea volcanoes. At a news conference at Mystic Aquarium in Connecticut, Ballard said that while he has a general idea of what his crew might find, the exploration is about looking for the unknown. ”We’re fascinated by extremely confusing parts of our planet and we say ‘let’s go there and see if we can figure it out,” said Ballard, a co-leader of the mission who is planning to join the ship later. The 211-foot (64-meter) ship, carrying a team of about 15 scientists, will travel through waters including the Hellenic and Aeolian Arcs, the Gorringe bank and the Straits of Sicily – a course that will take it near deep trenches, continental faults and cities under the surface of the Mediterranean that are more than 2,000 years old. The journey is expected to wrap up in November off the coast of Israel. Ballard, who is also a professor at the University of Rhode Island, founded the Institute for Exploration at the Sea Research Foundation, the nonprofit environmental organization that also runs Mystic Aquarium. Besides leading an international team that discovered the RMS Titanic in 1985 on the floor of the North Atlantic, Ballard found the wrecks of the battleship Bismarck and the PT-109 torpedo patrol boat that John F. Kennedy commanded during World War II. The 69-year-old explorer said his ship will dispatch video and audio feeds from this newest venture to connect with the public as he pursues new discoveries. The material will be available online and at a theater at Mystic Aquarium, and teams of educators will rotate aboard the ship to host information sessions and explain the latest finds. Mission co-leader Katherine Croff Bell said the live technology lets the ship expand beyond the knowledge of the scientists onboard. ”If we don’t have the proper expertise on the ship we can call somebody on shore and have them be a part of the exploration in real time,” Bell said. The ship’s primary mission is to make discoveries, not try to extract artifacts or disturb the seabed. For Ballard and the E/V Nautilus, that means setting themselves up for to find something new by planning trips over unusual or unknown areas. ”What really excites me is when you go looking for one thing and find something more important,” Ballard said. ”So we are all about creating moments of discovery by trying to get a little lucky,” he said. these comments appear as if they are left by brain dead visitors? like to keep up with everything new you have to post. Would you make a list of the complete urls of your social sites like your Facebook page, twitter feed, or linkedin profile? Hey very nice web site!! Guy .. Excellent ..
visit this weblog on regular basis to obtain updated from most recent gossip. time as searching for a similar topic, your website came up, it seems to be good. blog posts in this sort of area . Exploring in Yahoo I eventually stumbled upon this web site. taste is perfect, the articles is in point of fact great : D.
astonishing. The clarity in your submit is simply spectacular and i can think you are knowledgeable on this subject. Hi there to every one, it’s truly a fastidious for me to pay a visit this website, it contains helpful Information. that I’m totally overwhelmed .. Any ideas? Many thanks! type of wonderful informative site. I stumbledupon it 😉 I am going to return once again since I bookmarked it. Sweet blog! I found it while surfing aaround on Yahopo News. I’ve been tryting for a while but I never seem to get there!